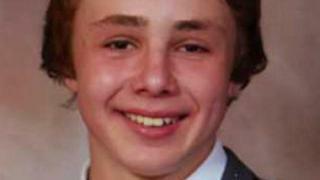 A teenager from the Isle of Man has admitted causing the death of a 17-year-old by dangerous driving. Brad Campbell, described as a "talented footballer", died when a Renault Clio driven by Brandon Gowland crashed at high speed in Foxdale on 24 August. Gowland, 18, from Onchan, pleaded guilty at Douglas courthouse to causing his death. Deemster Alistair Montgomerie bailed Mr Gowland who will be sentenced on the 17 April. Mr Campbell, an apprentice plumber, was found by paramedics in the back seat of Mr Gowland's car at about 00:10 BST. No other vehicles were believed to be involved in the crash. The 17-year-old, who had recently left Ballakermeen High School, lived with his parents and brother in Onchan.